A competent physics title, but nothing to crow about. Worm vs Birds lays its stall out without wasting too much time at all. 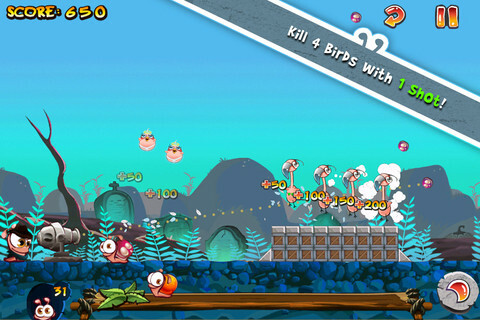 This is a game where you fire a variety of animals at a series of enemy animals, perched strategically around a series of levels. Whatever the story behind the game is, it's certainly fair to say that this is a title that bears more than a little similarity to the steady stream of games that have followed in the wake of Angry Birds' extraordinary success. As befits any physics puzzler hoping to make a name for itself on the App Store, the action's separated into a handful of themed chapters, all four of which are packed with a generous number of levels that each has a three-star rating up for grabs. You can take out multiple birds with a single shot. 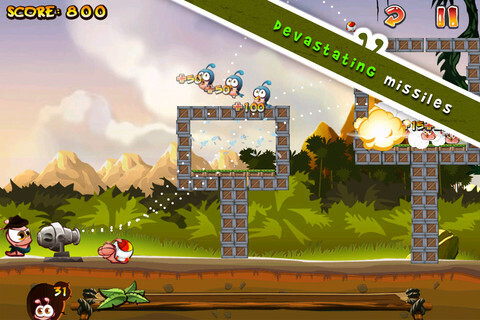 Different snails represent different sorts of ammo, so there's the single shot version that ricochets around the screen, taking out every bird it comes into contact with, a multi-shot version that rains havoc down upon the playing field, others that pass through platforms but still take out birds whenever they collide, and plenty more besides. The controls are decent enough, and tapping an area on the screen starts off a reliable chain of events as the ammo pings its way around the screen. What's not very clear at all, particularly when you first start out with the game, is which ammo you're about to go to bat with, so you'll experience many a level restart in lieu of a solid tutorial. Certain ammo will pass through walls but still destroy the birds. While it's not an unenjoyable game to play, it's certainly one where the budget feels stretched a little too thinly across the overall package. Everything you'd expect to be present and correct in a physics puzzler is certainly here, but the exceptionally brief, looping music in the early stages will drive you quite mad, the sound effects are extremely limited and low-fi, and the action, once you've gorged yourself on the first set of levels, is frankly rather uninspiring. There is nothing particularly wrong with Worm vs Birds per se, just that it struggles to justify its place on the App Store amongst the likes of Angry Birds, as well as the dozens of extremely competent games that the genre flagship spawned. As such, we can only really recommend it to those gamers who have exhausted the near limitless supply of physics platform puzzlers that are already available to them. What's Hot: A competent physics puzzler, even if it's not the strongest in a long line of contenders. What's Not: A low-fi feel to the audio and graphics, and a rather tired entry to the genre.